Thaw fish, if frozen. Rinse fish; pat dry with paper towels. Cut fish into 1-inch pieces. For sauce, juice two of the limes into a small bowl; cut the remaining lime into wedges and reserve for serving. Stir mayonnaise and chili powder into lime juice. Transfer 1/3 cup of the sauce to a medium bowl. Add fish; toss gently to coat. In a shallow dish combine flour and salt. Dip fish in flour mixture, tossing to coat. In a large skillet heat oil over medium heat. Cook fish, about one-third at a time, in hot oil for 2 to 4 minutes or until fish flakes easily when tested with a fork, turning to brown evenly and adding more oil as necessary during cooking. Drain on paper towels. 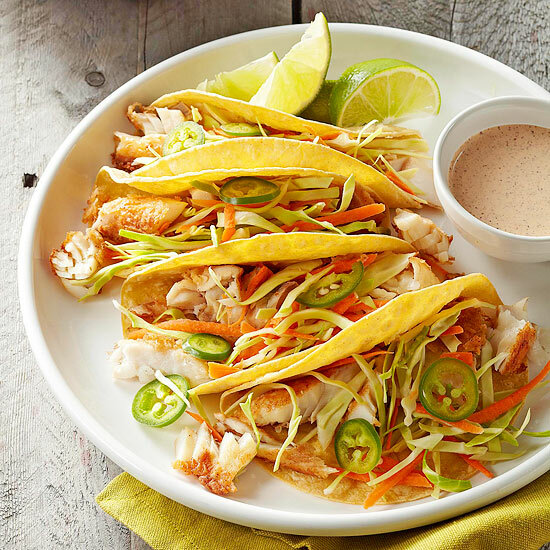 Fill taco shells (if using) with fish, cabbage, carrot, and jalapeno pepper. (If using tortillas, lay each tortilla on a flat surface; sprinkle ingredients down center. Fold sides over filling.) Serve with the remaining sauce and the reserved lime wedges.